Lisa Shepperd. Lisa has been making pots since high school classes in Miami. She continued to study and create while pursuing degrees in French and Environmental Studies, before returning to Florida to raise a family. 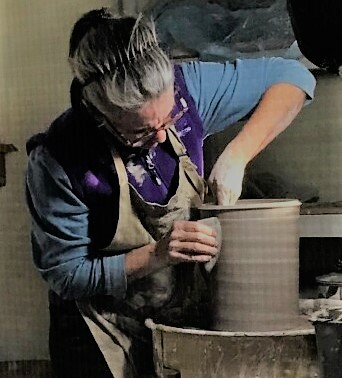 For several decades, she worked locally with a gas-soda kiln at Horse Creek Pottery, but is now altering her decoration techniques for electric firings. She continues to take every opportunity to study with talented potters near and far, including Mackenzie Smith, Jinsong Kim, Josh DeWeese, Lorna Meaden and Linda Arbuckle. Her favorite pots tell a story with graphic or narrative designs reflecting her interest in Florida’s natural environment. Her goal is to make everyday objects that are useful, attractive and fun! Lisa’s work can be seen daily at the Studios of Cocoa Beach, 165 Minuteman Causeway in downtown Cocoa Beach. The non-profit gallery features the work of 30 local artists and offers a full schedule of workshops in a variety of techniques for both adults and children. The Studios is open Monday and Tuesday 10:30 a.m. to 3:30 p.m., Wednesday through Saturday 10:30 a.m. to 8:00 p.m. and Sunday 11:00 a.m. to 4:00 p.m. For more information about exhibits, artists and workshop schedules, call the Studios at 321-613-3480 or visit www.studiosofcocoabeach.org.